When you want to have pages with different properties in Writer, you use page styles. If you want to do something similar in Word, you have to use sections. One of the benefits of page styles is that you can use them multiple times, and — as usual with styles — whenever you change your mind, you can edit just the style, and all its uses will be updated consistently. There is, however, one feature that Word sections have and we lacked so far: sections can have different headers and footers on first, left and right pages. 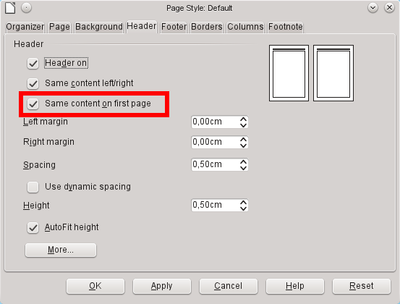 In Writer, you had to use two different page styles if you wanted to achieve the same: typically named "First page", then a "Default". This was because Writer could differentiate only between right and left pages, not first ones. Right now, only ODF filters are updated to open / save this feature (as suggested by this old proposal) — in later versions it’s planned to update the DOCX, DOC and RTF filters as well, removing quite some code from import filters working around this limitation of Writer core.